The UVM Medical Center wants to ensure members of our community, workplaces, and schools are knowledgeable in the use of compression techniques or a tourniquet in trying to stop uncontrolled bleeding. Join us for this FREE course. Register today. If interested please RSVP to bleedingcontrol@uvmhealth.org with your name and requested session. Please let your MRC Unit Leader(s) know of attendance. 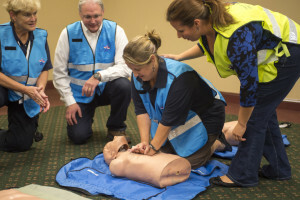 This EMT class will meet in UVM’s Rowell Building Room 111 from 5/20/19 – 6/21/19. You must contact the course coordinator Pat Malone at patrick.malone@uvm.edu to register. This course will prepare you for the National Registry Emergency Medical Technician certification exam, which will be scheduled after successful completion of this course. In addition to this certification, in order to become a State of Vermont licensed EMT, you must become affiliated with an approved EMS organization. To find the EMS agencies near you, go to the map locator at the top of this page.